Prosecutors Baek Joon-Soo and Oh Ha-Ra briskly proceed to the Seoul District Courthouse. On one side of the courtroom sits Geum Tae-Woong and his two defense lawyers; on the opposite side sit Ha-Ra and Joon-Soo. In the public viewing area sit Chief Yang, Officer Lim and Investigator Go along with Sa Do-Chan’s team. Behind them are numerous reporters with their computers on standby, ready to type. Today is the trial of case number 2018GO1099, that of Geum Tae-Woong who is accused of murder, attempted murder and committing Special Economic Crimes, along with other serious crimes. The presiding judges ask for the prosecution to please state what charges have been brought against Geum Tae-Woong. Prosecutor Ha-Ra stands, faces the judge and bows. She begins reading from her notes, stating that Geum Tae-Woong had committed the following crimes. - He obtained assets through the illegal selling of drugs, which he had employed diplomats to smuggle into the country since 2014. -He ordered the murder of Nam Seung-Tae who reported him. -He ordered the murder of the sole witness, diplomat Park Young-Jin. -During the process of taking over K Savings Bank, he had the president Gye Choon-Shik murdered and staged it as a suicide. - While in the process of finalizing a contact for the natural gas in Turkmenistan, he himself murdered Viktor Jang and Sa Ma-Chun. Ha-Ra sits down as the judge asks the defense lawyers if they wish to cross examine the witness. Standing to address the judge, Geum’s lawyer declines cross examining and wants to call his first witness to the stand, Jo Sung-Doo. All eyes in the courtroom turn to watch as Sung-Doo approaches and sits in the witness stand, while Geum smugly observes his savior. The defense lawyer asks that a monitor screen be turned on, showing various phone text conversations between an individual and Sung-Doo with reference to Nam Seung-Tae and depositing money from the sales of drugs. The defense lawyer asks Sung-Doo who sent him the texts to which Sung-Doo replies, Kim Hyun-Wook. The lawyer then asks who hanged Nam Seung-Tae on Mount Bukhan? Again Sung-Doo replies it was Kim Hyun-Wook. The defense lawyer then turns to the judge and claims that this is evidence that Geum Tae-Woong had nothing to do with the drugs or the murder of Nam Seung-Tae. All plans and actions were soley on Kim Hyun-Wook’s orders. Feeling very victorious, Geum hides his joy while the prosecutors remain silent. Outside the courtroom, Sa Do-Chan leans up against a pillar, deep in thought and spinning his fidget spinner. 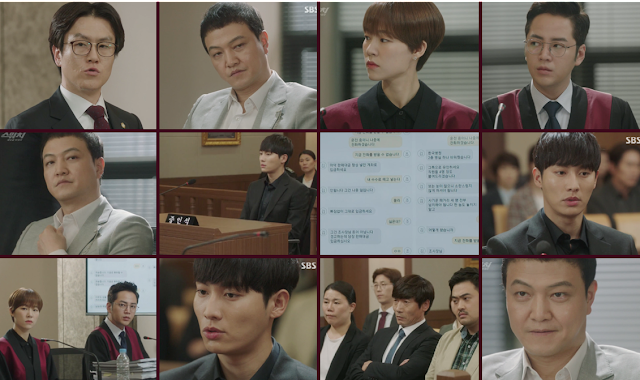 Geum Tae-Woong, now sitting in the witness stand, is approached by Ha-Ra who states that as an employee of Feel Gallery, Kim Hyun-Wook was instructed to kill Nam Seung-Tae, Park Young-Jin, Gye Choon-Sik and Jung Do-Young by Geum himself. Geum retorts with the reminder that one is innocent until proven guilty and challenges her for proof. When asked, he confirms that it was indeed Kim Hyun-Wook who ordered those killings and used Jo Sung-Doo as a puppet. Geum suggests that they summon Kim Hyun-Wook to the stand and see what he has to say, knowing only full well that Kim's presence is not at all possible. They look at each other for awhile, before Ha-Ra tells the judge that she has no more questions for Geum Tae-Woong. The judge then asks if the defense have any more witnesses they wish to call to the stand. After informing the judge they do not, Geum stands and returns to their table. Chief Yang leans over to Investigator Go and wonders why Ha-Ra is not being more aggressive in her approach. Go does not know but suggests that maybe she and Joon-Soo have a evidence to use later on. Suddenly standing up, Baek Joon-Soo asks to cross examines Jo Sung-Doo again. Another lawyer for the defense team stands up, objecting to the request as there is no grounds to re-examine the witness. Joon-Soo informs the judge that Sung-Doo has some crucial evidence that is relevant to the case. The judge overrules the defense lawyer and Joon-Soo is able to continue. Jo Sung-Doo returns to the witness chair once more while Geum appears somewhat concerned. Joon-Soo questions Sung-Doo about whether he had locked up and physically hurt Nam Seung-Tae under Kim hyun-Wook’s orders. Sung-Doo answers yes. Seeking more information, Joon-Soo wants to know if Sung-Doo is aware of the nature of Nam Seung-Tae’s death. 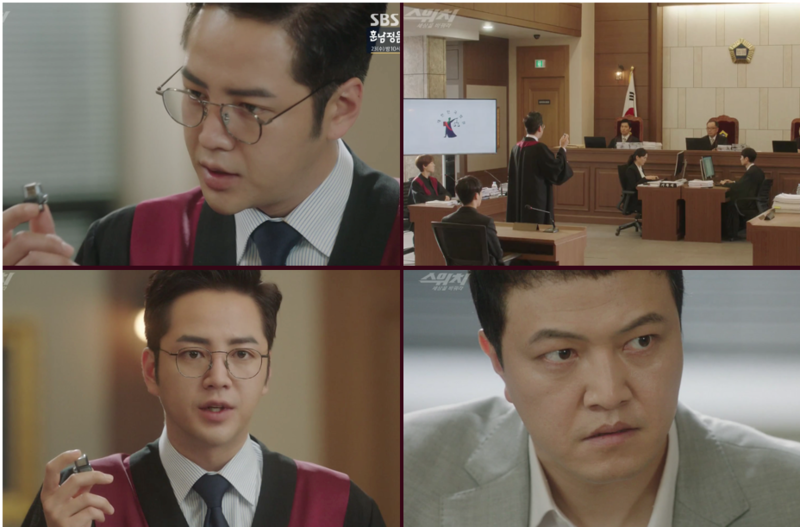 Horrifying Geum and those unaware of this fact, Sung-Doo confesses in court that he had personally killed Seung-Tae and disguised it as an accident. Geum Tae-Woong sits up in his chair, staring at his son. Baek Joon-Soo then asks Sung-Doo why he detained Nam Seung-Tae in the first place. Without his confidence wavering, Sung -Doo tells the court that Nam Seung-Tae had in his possession a video of the money exchange for illegal drugs. Geum Tae-Woong starts to look visibly upset now. This is not going according to his plan! Ha-Ra hands Joon-Soo the USB containing the video and shows it to Sung-Doo who confirms that it is that USB to which he referred. Joon-Soo asks the judge that he be allowed to enter the USB as Exhibit Four in the trial. Objecting once again, the defense lawyer claims that they were not aware of this new evidence; however, the judge overrules the defense lawyers objections and allows Joon-Soo to continue. Baek Joon-Soo continues to inform the judges that they were concerned for the security of this new evidence and the safety of Jo Sung-Doo’s life if they introduced the evidence at the beginning of the trial. The USB is handed to the court clerk who plays the video for the court to view. Again all eyes in the courtroom are on the overhead screen monitor which shows the exchange of money for drugs and the man receiving the drugs is clearly evident in the video. He is Geum Tae-Woong. Throughout the courtroom gasps are heard. Geum Tae-Woong jumps to his feet mortified at what his son has done - he produced damning evidence to bring Geum down and the rage starts to appear on his face. Baek Joon-Soo pointing to the screen asks Sung-Doo if this man in the video who murdered and instigated murder is also known as Grizzly, to which Sung-Doo tells him yes it is. Director Bong stands up and turns to the reporters, announcing that Geum Tae-Woong is Grizzly and ensuring they make that known in their reports. While the chatter begins in the public viewing area, Jo Sung-Doo recalls his meeting with Kim Hyun-Wook in jail. Kim had told him where the USB had been hidden, if anything was to happen to him while he was in jail. 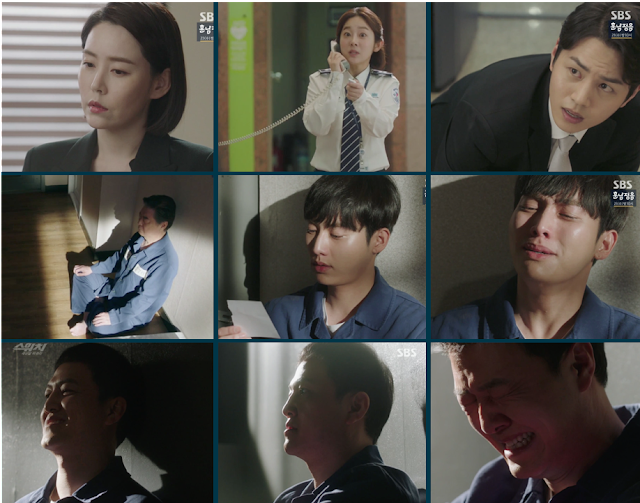 After being set upon and falling into a coma, Sung-Doo retrieved the USB and handed it over to Sa Do-Chan, who in turn gave it to Baek Joon-Soo. Once the crowd calmed down, Baek Joon-Soo continued with his questioning of Sung-Doo. 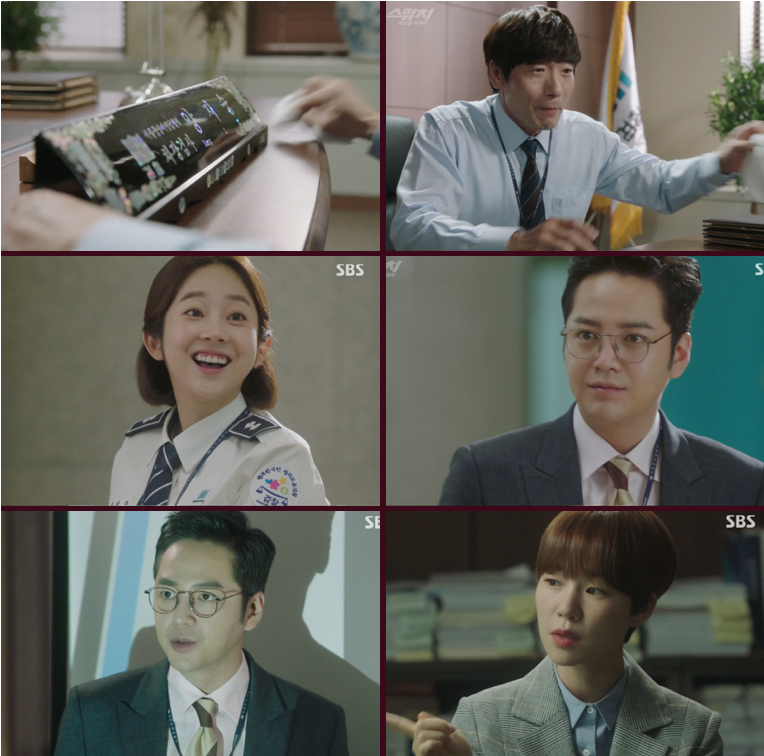 With reference to when Ha-Ra questioning him earlier on, saying the murders had been instigated by Kim Hyun-Wook, Joon-Soo asks why Sung-Doo lied in court. Savoring the feelings of sweet revenge, Jo Sung-Doo says, “I was ordered to do so’. While Geum Tae-Woong suddenly realizes that he's being betrayed, Joon-Soo asks Sung-Doo who ordered him to lie. Sung-Doo slowly raises his hand and points directly to Geum Tae-Woong and slowly says his father’s name out loud. Turning to face the judge, Joon-Soo tells him that will be all and goes to sit down. The courtroom is stunned at this latest turn of events. Geum Tae-Woong’s nose twitches as he stares at his son who gives his father a jubilant smile. Geum Tae-Woong is livid and slumps into his chair. Knowing that he will also go to jail, Sung-Doo leaves the courtroom as his father falls back into his seat in shock. The court returns for sentencing. The Lead Judge summarizes the findings: Geum Tae-Woong destroyed evidence in order to cover up the murders; he embezzled millions of dollars from financial institutions; he spread false news and bribed some of the prosecutors. Moreover, he shows know signs of remorse and is not able to be reformed. Before the judge reads out the verdict, Sa Do-Chan quietly enters the court room, just in time to hear Geum Tae-Woong’s punishment. The judge reads out the sentencing, finding Geum Tae-Woong guilty on all charges brought against him, describing them as being ‘extremely heinous’. He is pronounced guilty and sentenced to death. The prosecution team relish in their victory! Ha-Ra sighs with relief while Joon-Soo closes his eyes and sighs. Ha-Ra sees Do-Chan in the background, and he gives her a fond smile of acknowledgment. Geum Tae-Woongm now finally recovered from the shock of the trial's outcome, stands up and throws a fit of rage and shouts. He throws the pile of papers on the floor, yelling that he will not be executed. Still seething with rage, he upends his table before two security guards grab hold of him and restrain him. Seeing both Sa Do-Chan and Baek Joon-Soo in the room together he threatens them, vengefully announcing to the whole room that he is in actual fact Grizzly as he is dragged out of the court room. Meanwhile in hospital, Kim Hyun-Wook begins to awaken from his coma, moving his fingers and opening his eyes. As Geum is dragged from the court room, Ha-Ra notices that Do-Chan left and goes after him. She manages to catch up to him outside the courthouse building, yelling out to him before he is out of reach. Wanting to know where he is going, Do-Chan reminds her that in the beginning they agreed that when this case finished they would say goodbye forever. Ha-Ra remembers but tells Do-Chan that things have changed; she trusts him now. Ha-Ra remembers she has something for Do-Chan and pulls out something from her pocket and hands it to Do-Chan. It is a photograph of Do-Chan and his father sitting in the park. He tells Ha-Ra ‘it’s my family photo. The one and only.' Ha-Ra reminds Do-Chan to live as his father said in his last breathe, “The biggest con in life is winning over a person’s heart completely”. Looking at each other, Do-Chan thinks for while then gives Ha-Ra a wry smile and says, ‘Oh Ha-Ra, a big con requires a big set up. Can you handle it? Smiling at each other, there are no further words to say as Do-Chan walks away. Sa Do-Chan, Director Bong, In-Tae and Eun-Ji exit a bank together with their bank books in hand, when Do-Chan turns around and tells them to keep greetings short and goodbyes even shorter. Not quite catching on, Eun-Ji is confused until Do-Chan tells her she should go the Maldives where she always wanted to go; that In-Tae should re establish his company; and Director Bong should make that movie and go to Cannes. 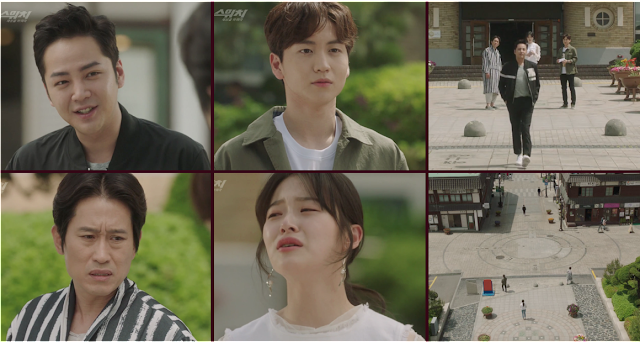 Bong says he will write their story into a script; In-Tae promises to use the money wisely, confident in where their future will take them; while Eun-Ji is lost. What is she to do when she misses them? As the three men turn and walk away, poor Eun-Ji is left standing alone with no where to go, as if bereft of family. Distraught by their sudden departure, all she can do is cry. In District Prosecutor Jin Kyung-Hee’s office, Jin reflects on her career and waits for the arrival of Internal Affair Officers. When they arrive, she tells them she is ready to go. She knows she will be interrogated for the acceptance of bribes as well as aiding and abetting criminal actions. At the same time, desperate to avoid being associated with Geum’s activities, Gil Dae-Ro tries to exit the building as fast as he can. As he reaches the turnstiles, Mi-Ran, at the security desk, locks the turnstiles. Thinking he can do what Ha-Ra did, Gil attempts to hurdle over the turnstiles, but his foot clips the screen, and he falls onto the ground, injuring and making a spectacle of himself. Now not able to escape, officers from internal affairs see him and demand that he accompany them. With the Internal Affairs investigation finished, Choi Jung-Pil sits quietly, leaning against the wall with his eyes closed in his own cell in the detention center. Jo Sung-Doo, in a cell with three other cellmates, silently flips the pages of a bible and takes out the photo of his mother and himself as a child. The portion where Geum Tae-Woong stood is now torn off. He stares at the photograph and breaks down sobbing, still hurting badly from all that his father did to them. Geum Tae-Woong also has a cell all to himself and stands against the wall, reflecting on what happened and how he, the great Geum Tae-Woong, was brought down. In a hypnotic like state, he mutters to himself that he should not have trusted his own son, but he did. Recalling when he had told Kim of the worst kind of punishment was not having someone to love and who loves you, he realizes that he only brought this reckoning upon himself. With sorrow at his own doing, he slumps to the floor. But then as if flicking on a switch, his face changes and he tells himself that no he didn’t do this, ‘I don’t trust anyone. I don’t get deceived. I am Geum Tae-Woong.’ Using this like a mantra, he reminds himself of how strong and powerful he is. However, the emotions of being alone for so long begin to break through. Like a man who is losing his mind, Geum Tae-Woong's laughter is mixed with the turmoil of utter grief. In the marketplace, Ha-Ra mother uses Sa Ma-Chun’s flattering antics to show the new corn kettle seller how it is done. She cons a passing lady into buying the corn cracker, using the now familiar ‘you look like Audrey Hepburn’ line which promptly does the trick! Telling the stall owner ‘this is how you do business’, she wishes him luck, smiles, and walk away. In his new office, the newly appointed Deputy District Prosecutor Yang polishes his name plague, ensuring it shines brightly. He calls his wife and asks her to give a generous donation to the temple, while he will be giving an offering at church later on. Then smiling happily, he returns to polishing his plaque again. Baek Joon-Soo enters the building to begin his day, but before he goes through the turnstiles he remembers to fulfill a promise he had made to Sa Do-Chan. He is to say hello to Pretty Mi-Ran. Hesitantly, Joon-So greets Mi-Ran who returns the greeting, all smiles! She is beyond pleased! Joon-Soo, seeing her joyful greeting, smiles as he walks away. Now that Guem and his accomplices are safely locked away and Sa Do-Chan is gone, Joon-So and Ha-Ra resume their duties. In their office, Joon-Soo, Ha-Ra and the team have a new case. Choi Young-Min, chairman of the Free Hearted Foundation, is holding a charity auction with designer goods up for sale. The issue is he has been pocketing the donation money for himself. However, they need to find conclusive evidence before they can arrest him. In an ornate drawing room of a hotel, a fashion designer from Japan plays the piano while waiting for Choi to arrive. Displayed around the room are various items of clothing hanging on racks which are being rearranged by staff. Watching the fashion designer tinkling on the ivory is the interpreter, Director Bong. The pianist is none other than Sa Do-Chan! Team Switch is back! Chairman Choi enters the room and waits for the pianist to finish. They exchange greetings and Choi thanks the designer for his generous donations. Interpreting for the designer, Bong translates in Korean, using the right and appropriate words. Sa Do-Chan, Japanese, asks Choi if he is happy knowing that he is exploiting others, calling him a jerk! Bong, however, chooses a different interpretation. Selecting an item of clothing from the rack, Do-Chan presents it to Choi as a gift. In-Tae directs Choi to the fitting rooms. While Choi is putting the item on, the team disperse. In the lobby of the hotel, the prosecution team arrive. Bursting into the hotel room, Ha-Ra, Joon-Soo and the team enter to see Choi wearing a strange and hilarious outfit with the sleeves sewn together, restricting his arm and hand movements. On the television screen in the room, an incriminating video plays of Choi giving instructions to only report 20% of the donations. The rest of the money is to be deposited into a named bank account. Joon-Soo and Ha-Ra are baffled as to how it is that everything is all neatly presented to them. Then Ha-Ra sees Do-Chan’s fidget spinner. As she spins it, they smile at each other. Although they had said their short goodbyes, Sa Do-Chan and his team are ready for another day! As the final recap writer for TEF recap of Switch, I am happy to leave this series with a few of my thoughts. Switch has been a marvelous ride from start to finish, and I know all eels and fans will agree, as I have seen and read in all SNS channels 😊 The writers, directors and producers made sure that every episode is chock full of twists and turns and excitement, and each episode ending with a cliffhanger so we are left wanting more! What can I say about Jang Keun Suk, ActorJang, Asia Prince? He is the ultimate. It may seem like a free and breezy role for him as SDC, but, in filming, he probably had to take off the SDC hat and personality and don the BJS one a dozen times a day, and BJS was a total opposite to SDC! How he does it I’ll never know. All I know is that JKS is a brilliant, talented actor and a consummate professional and he makes us laugh, and cry, sometimes all at the same time! I love you Jang Keun Suk; you are the very best! The ending was a happy one in most respects. 😊 Baek live;, Geum was caught; OHR and team keep their jobs; and SDC gets to go off. My only slight regret is that SDC and OHR did not get together, because they obviously had become close and grown very fond of each other. I believe that Baek surviving and living, sacrificed the love between the two. 😊 No time to fit in a love triangle. haha! So this was the next best bet. Well, we live in hope of Switch2. Yes, my friends and Prince?! Fingers crossed! Special mention to the soundtrack too, which was so good and brought the scenes alive so appropriately! Several of the feel good ones were terrific for the wins! My personal favorite one was Raise Me Up, by no other than Lee HongKi, that conveyed love and tenderness and sometimes regret and sadness too. Thank you Actor Jang and everyone who had a role in making Switch. It truly was DAEBAK. Congratulations, you really should pop the champagne!!! I wait patiently for Jang Keun Suk’s next drama and projects, because I support him always and will be on this voyage with him. Thank you all for coming along on the Switch roller coaster ride with us!